Megalops Atlanticus: Powerful with heavy, bony plates around the head and jaw, these magnificent fish are known to reach 200 pounds or more in the Tampa Bay area, but more often range between 50 and 150 pounds. They feed on live and dead baits, as well as a wide range of artificials, making for numerous fishing options. Tampa Bay Tarpon and Permit fishing offers the perhaps the greatest thrill of all inshore angling. These powerful fish flood the beaches off Tampa Bay every spring,, moving into the bay in the summer and remaining until fall. Of course there also are resident fish that remain year-around so while there are optimum times of the year to fish them, Tarpon are always an option in this part of the state.There are numerous ways to fish these amazing creatures and anglers can take their pick based on their skill level. The beauty of tarpon is that despite the huge challenge they present to expert anglers, they also are easily handled by beginners with the proper technique and the help of your guide. • Fly fishing Tampa Bay Tarpon: This is a sport for those experienced with heavy saltwater fly tackle like a 10 or a 12wt. It consists of stalking schools of fish on our beaches or at night under the lights, putting the boat in position to cast to schools of fish as they travel along the bridges or are beaches in pods. 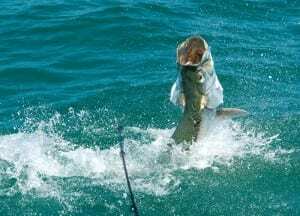 • Plug/jig casting for Tarpon: If you are a capable caster with spinning or baitcasting gear, you may opt for trying your hand at presenting a plug or a jig with a soft plastic tail. Much like fly fishing, anglers are positioned to cast to schooling or milling fish, allowing the bait to sink in the path of feeding fish. It is practiced on the beaches and inside the bay. • Live bait fishing for Tarpon: This method is used on our beaches and inside the bay, from open waters to around structures like bridges. Baitfish, crabs and even shrimp are used at times, for taking everything from small canal fish to monster silver kings well over 150 pounds. • Dead bait fishing for Tarpon: With this method, fresh dead baits like mullet or shad are fished on the bottom. 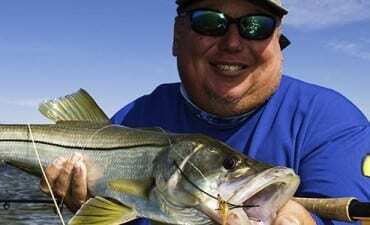 While not as glamorous, it nevertheless is one of the most effective ways for newcomers to tie into huge fish. One of the greatest advantages of Tampa Bay Tarpon fishing is that it offers an escape from the crowds of anglers who pursue them on the south Florida Beaches and around Boca Grande Pass and Charlotte Harbor. If you have had hectic tarpon fishing experiences in the past trying to share overcrowded waters in pursuit of your trophy, you owe it to yourself to take a look at that the bounty of fish that can be found between Clearwater and Longboat Key, including all of Tampa Bay itself. Away from the maddening crowd, you will find the experience an enjoyable one to remember. Tarpon Fishing Tampa guides know the habits of these special fish and are ready to guide you to them. From the backwater bays and rivers to the open waters off the sandy beaches, be sure to have your camera ready and loaded, because nothing beats Tampa Bay Tarpon fishing.